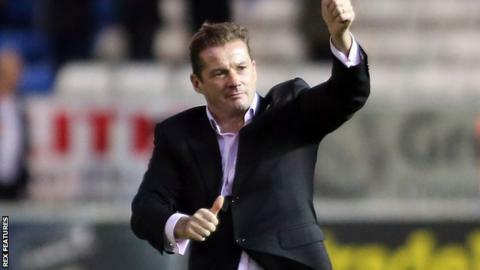 Peterborough United boss Graham Westley says his League One Manager of the Month award is a reflection of the work of the entire club. The Posh are on a six-game winning streak and have moved into the play-off places having won nine of their last 12 games in all competitions. "It's very much a collective scenario and everybody plays their part and does their bit," Westley said. "You know you're in a good place when the manager gets that award." Peterborough were outside the relegation places on goal difference when Westley was appointed in September after the club sacked Dave Robertson. Since then, Westley's side have lost on just three occasions. "It's very common that you win an award like this as a manager and you give it away to everyone else and say it doesn't matter," he told BBC Radio Cambridgeshire. "I think that it does matter, it's a reflection of what your lads have done and a reflection of the way the club has pulled together. "I think it's important that you look at what you've been doing and you take a lot of confidence from it. "The players have worked exceptionally hard to play fantastic football, to create numerous chances, and to score a lot of goals."